Located a little over three hours north of San Francisco, the Country Inn B&B (www.beourguests.com) makes a perfect home base for exploring the Northern California coast. This Fort Bragg property, which is a good choice for slow walkers and part-time wheelchair users, simply oozes country charm. From the chicken coop out back to the hearty country breakfast served up every morning, it’s a far cry from your typical chain hotel. And that’s a very good thing. You’d never figure that innkeeper Christine Churchill is a Bay Area transplant either, as she welcomes her guests with a decided country charm, with her canine assistant Riley at her side. Churchill and her mother relocated to Fort Bragg in 2012, and immediately set out to renovate the aging property. Today guests can enjoy the fruits of their labors. Parking is available behind the inn, in a level asphalt parking lot. Although steps grace the front of the house, there’s ramp access from the parking lot to the accessible Autumn Song room. 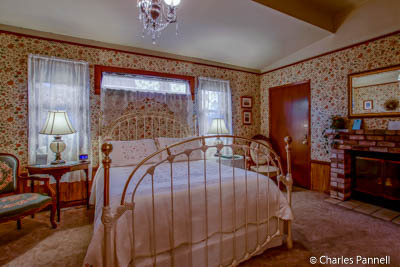 The room features wide doorways and is furnished with a 25-inch high queen-sized bed with wheelchair access on both sides. The tempur-pedic topper — an amenity not usually found at country inns — is also a nice touch. Other furnishings include two night tables and two side chairs, but Churchill is quick to point out that one chair can easily be removed for better pathway access. 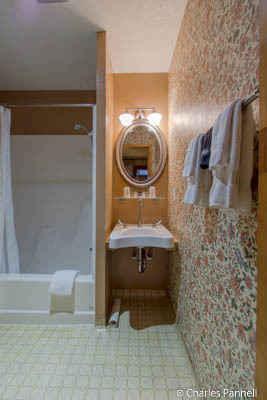 The spacious bathroom is equipped with a tub/shower combination and a hand-held showerhead. 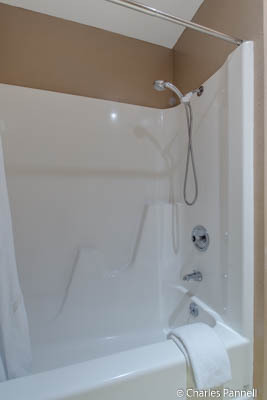 There is a vertical grab bar outside the tub, which offers additional support for folks who have balance problems. 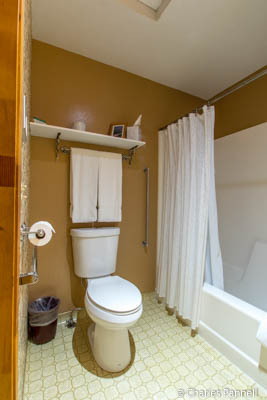 The toilet grab bar is located on the right wall (as seated), and the bathroom also has a roll-under sink with lever handles. It’s a nice setup — one that will work for many slow walkers. Autumn Song is one of two rooms that has a fireplace, and as an added bonus there’s no TV in the room. It’s a nice place to snuggle up with a book, or just enjoy some down time with a loved one. There’s level access out to the dining room, and to the adjacent front porch, but there are two steps down into the family room. And if you’d like to go say hello to the girls, there’s level access over a dirt area to the chicken coops out back. Churchill also has one rooster — Thumper — who is sequestered in a sound proof coop at night, so as not to disturb guests in the morning. Now that’s country hospitality! Breakfast is an affair to remember at the Country Inn B&B, as Churchill’s repertoire includes morning favorites such as biscuits and gravy topped with a hard boiled egg, lemon ricotta pancakes and huevos rancheros. The portion size is more than substantial, and I guarantee that you won’t go away hungry. Breakfast is served in two seatings around a common table, which is great if you want to chit-chat with other guests. If you’d like a bit more privacy, ask about room service when you book your room. On the other hand, if you visit mid-week and choose the early seating, there’s a good chance you’ll have the dining room to yourself. Churchill is happy to assist with dining or sightseeing suggestions, and the Country Inn B&B is just a short drive from three accessible coastal trails. The newly opened Fort Brag Coastal Trail tops the list with sweeping coastal vistas, while the MacKerricher Haul Road Trail heads north over a former train trestle for equally impressive ocean views. And for a very accessible whale watching venue, head over to MacKerricher State Park, located three miles north of Fort Bragg. No matter what you choose, there’s no shortage of accessible outdoor opportunities in this very scenic — yet often overlooked — slice of Northern California.